"Why can't you scientists leave things alone? What about my bit of washing, when there's no washing to do?" 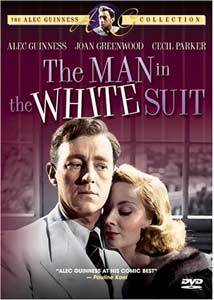 The description of this movie might not hook you—it's a comedy about textiles!—but if you've seen any of the other Ealing Studio comedies of the period, or if you're an Alec Guinness enthusiast, you'll be well pleased that this elegant little movie has come to DVD. It's not a comedy for fans of Jackass, that's for sure, but no movie can be all things to all people, and the particularly British pleasures of this one can be tremendously rewarding. The idea has genius in it, obviously, bit it also makes Stratton many enemies, for so much of industry is predicated on a planned obsolescence. Why ever, for instance, would Michelin want to sell you tires that never wear out, when they can count on you as a return customer every couple of years? Management at the textile plant figures this one out early, and soon too so does the labor force—if the clothes will last forever, no one will have to buy new ones, and they'll all be out of work. There aren't many things that can bring the workers and their bosses together, but Stratton's too-clever scheme is one of them. There's obviously lots of industrial satire here, though it surely is not as apocalyptic as something like Modern Times; there's also an element of Cold War thinking at work, as two of the textile plants square off against one another, in a sort of garmento mutually assured destruction. Stratton has recently hopscotched from the Corland mill to the Birnley one, and Mr. Birnley's daughter, Daphne (Joan Greenwood) wants to marry Mr. Corland (Michael Gough); Corland is also, not incidentally, hoping that Birnley (Cecil Parker) will make a sizable investment in his plant. Daphne is enlisted to play a Mata Hari of sorts, to convince Sidney of the error of his ways—she's not quite a love interest, but she's the only one in the story who seems to have Sidney's best interest at heart, and to cherish progress more than money. The word that gets used frequently for movies like this is "droll," and it's probably the right one, as this is more charming than flat-out hilarious, but it is very well done indeed. It's a smart mixture of satire and physical comedy—Stratton blows plenty of stuff up real good, and there's the obvious comedy in veddy proper Englishmen discussing and working with a fabric that can be tailored only with a blowtorch. There must be generations now who think that Guinness is only Obi Wan, and this may be a revelation to some and a reminder to others of what a deeply gifted comic actor he was. Image Transfer Review: They were doing something right back in the day at the Ealing Studio, and kudos to Anchor Bay, for the transfer to DVD is an excellent one. The gradations in the black-and-white photography are nicely preserved, as is Mackendrick's frequent use of deep-focus photography, and the title garments are downright luminescent. One of the best transfers I've seen of a film from this period. Audio Transfer Review: The sound may not be as sharp as the picture, but it's certainly more than adequate. There's very little hiss or buzz on the audio track, and though the capacity of the mono track is of course limited, all the dialogue is readily comprehensible. Extras Review: An original trailer, along with an extensive biography and selected filmography for Guinness, are the only extras. A delightful little satire with a fine central performance by Guinness, it's especially pleasing to report that the movie looks so fine on DVD. It's a lovely way to pass an hour and a half; highly recommended.